Not only have these been a handy organizing tool, they have given me moments of serenity in my chaotic life. I use these calendars to scrawl reminders on each delineated day in an attempt to be organized. I can never find the same pen to do this, so the result might be a mixture of red Sharpie and green crayon and at least half the time blue pen that is running out of ink, so I can only read half of what I scrawled, like “Bday Pty!”, but have no idea which child was to attend and where it was supposed to be held. People like me rely heavily on Evite reminders for these useful tidbits of information, so keep them coming. But my calendar never came this year. The agent either gave up on me as a potential buyer (and I need to borrow from Pretty Woman here when I say BIG mistake, HUGE! I now have almost $100 put aside for this purchase…), or figured paper calendars were going the way of the Betamax machine. Whatever the reason, this aberration has caused January to be a gong show for me. And for those who know me personally, I mean even more so than usual. I’ve been writing things on scraps of paper when I’m out that never land anywhere useful. I’ve been getting emails for dinner invitations, but unless it’s for tomorrow I have no idea if we’re free. Mothers have been trying to schedule playdates and I am stymied, never knowing if my child is available or not. Friends try to plan things with me, and after looking at them blankly, I gaze up above their heads to see if I can produce a mental picture of what my January would have looked like if I had that darn calendar. Of course, it was on my mental to-do list to go and buy a calendar, but I kept forgetting. I finally hit rock bottom when I barely got my children’s hot lunch order in with 2 minutes to spare, and kept them home for the first hour of school to do it. Missing a hot lunch order would be the equivalent of missing a free trip to paradise, since it gives me two blissful evenings of not wondering what the hell to put in their lunches the next day; you do NOT want to miss this deadline. This near catastrophe forced me to take a good hard look at my inability to organize. Sure, I was missing a piece of paper, but was something deeper and more profound happening? Was there a fear I was afraid of addressing? Yes, of course there was. Subliminally, I realize there is a much better way of organizing one’s life that I ignore every day on my computer. It’s called iCal. This is another reason why I haven’t broken down and done the walk of shame to buy a paper calendar. I have been holding out for the same reason I print my digital photographs: what if your computer dies when you desperately wanted to brag to your dinner guests about your last family vacation? What if my computer doesn’t wake up one day, and I have no idea what is on my iCal? Having committed my life to the Apple dominion, I was holding out on this one last sacred part: my time. But flying by the seat of my pants for this entire month with no visual calendar besides the one in my head has emboldened me. Sure, I almost missed a few things and forgot to pick up my daughter once, but otherwise my family survived, unscathed. Maybe I could deal with a computerized calendar after all. If it died, I might yet live. My friend showed me her nifty iCal, all color-coded for different children, with little boxes to check off on your to-do list as they are accomplished. I really love ticking off boxes, so I threw myself into the Apple ring even more so, and plugged in every activity I could think of. More are coming to me as I write. It’s very therapeutic, lifting these medial tasks off of my brain. I’m sitting patiently with my signal light on, waiting for the long stream of cars in my rear view mirror to drift by before I inch out into the road. Although these cars are only going about 20 km/hour due to the stop light a half a block away, not one stops to let me in. After fifteen years in British Columbia, I’m used to this. Drivers in this part of the world generally don’t pause to let you in; being a couple car lengths ahead of the game is more important. Unless, of course, they want your parking spot. Pedestrian’s face a similar fate crossing our roads; on busier thoroughfares they age gracefully while waiting for motorists to acknowledge them. We live a short walk from my children’s school, but lying in between our house and the school is a crosswalk on a fairly busy road. I have no faith that Vancouver drivers will stop for my half-pints, despite the fact it is a school zone. I prefer to accompany them across the road myself. It is not like this in all parts of the world. I know this because growing up in the Maritimes, if a pedestrian so much as pauses to consider crossing the street, traffic halts in both directions. It’s true, this happens regularly back east: drivers actually stop for pedestrians. I have been forced to cross many a-road simply out of guilt, perhaps having paused at an intersection dreamily assembling a torrid plot for my next novel. I return from my trance and cars are waiting expectantly, smiling, bidding me to change direction. 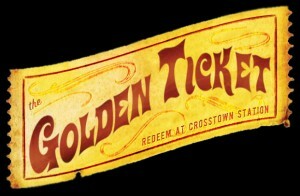 So I cross, wanting to appease them for accommodating me. I have always aimed to please. I’d like to compare driver’s handbooks from my former province and my current one, because drivers have drastically different driving manners. Letting people into traffic streams isn’t in either handbook, but it’s just a polite thing to do. When I learned to drive, stopping at crosswalks was certainly in the book, and you would have lost marks on your driver’s test had you breezed by a pedestrian at one of these clearly delineated places. In Vancouver crosswalk lines might as well be targets, they scream “speed up so that the pedestrian can’t cross the road!” If I have risked my limbs to cross in front of an approaching car, I am barely a step past the car in the crosswalk before they blast by me. As much as I love Vancouver I miss those Maritime drivers, who give you a smile and a wave when they stop to let you in. Like any good suburban North American, I spend a fair amount of time in my car, and think the western world could be a kinder and gentler one if people would act that way when they’re driving. Never even mind road rage. As I don five layers of clothing (moisture wicking base first, merino wool layer second, various thermal things that will fit thereafter), carefully stick my toe warmers on top of my wooly socks, and wedge my foot into my cumbersome ski boot, forcing the buckles closed an aerobic exercise in itself, it strikes me that skiing is an absurd sport. I stuff my pockets with money, tissues, hand warmers, lip balm and granola bars, and head out into the dark morning looking like the Michelin Man as I juggle my helmet, skis, pole and gloves, with no free hands to do things like open doors. Despite dressing at a speed that could rival the Six Million Dollar Man, I’m overheating before I get outside, the frigid outdoor temperatures turning my sweat into an ice cube that inconveniently coats my body, transforming me from a barbecue to a freezer before I can yodel yard sale. But then I’m at the lift and anticipation washes over me: some days you ski, and some days you don’t. This one I’m skiing. Symphony Bowl - can you hear the music? 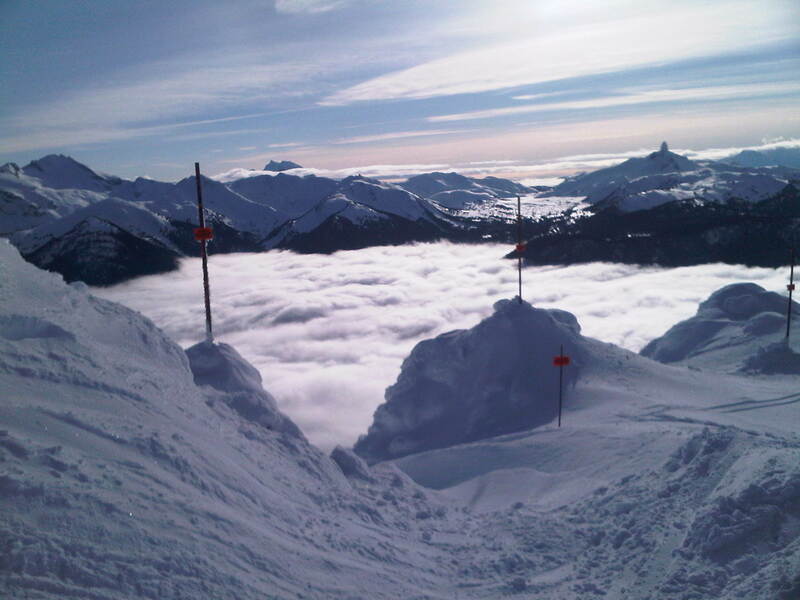 I can never decide what I like best about skiing: The vistas, when you have them? The act of hurling yourself down a mountain at break-neck speed? Floating almost effortlessly through champagne powder? Laughing, (hopefully, once you make sure all of your digits are moving) with friends over good wipeouts? Enjoying a cold beer apres-ski? The thigh burning workout, always negated by a big bowl of chili and white bread at lunch? Even the days they are handing out garbage bags at the lifts to shield you from the rain, spending a day skiing always seems better than the alternative. 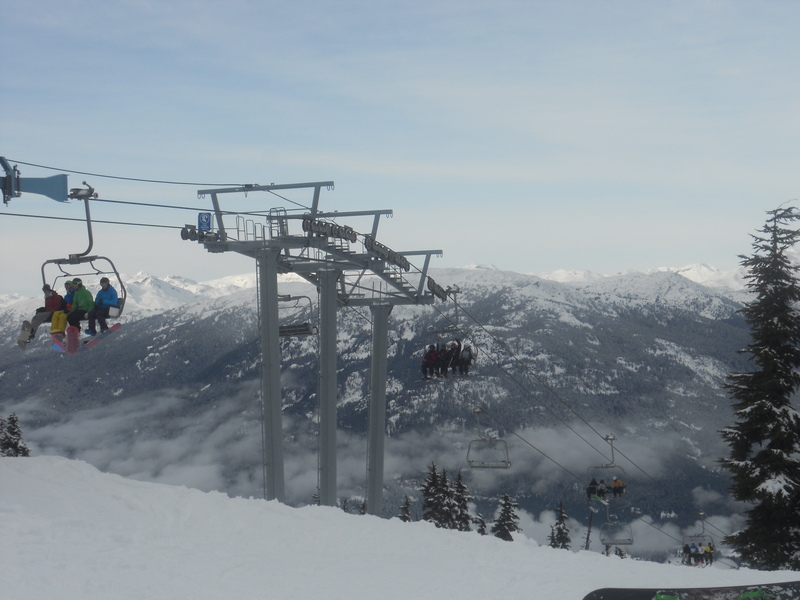 Unlike the real world of line-ups, in front of a ski lift everyone is happy. A sea of smiling faces. After you! No, after you! How do you like those skis? Have you been to Symphony Bowl today? Typical chatter amongst skiers, comfortable in the skiing fraternity. There is hope for humanity after all. This is one of the things I love about skiing. A bluebird day, clear skies making the white snow glow neon. Peaks and snow and sky as far as the eye can see, skiers darting like ants back and forth down the slope. I breathe mountain air and it goes straight to my soul. Surely this must be the best thing. This is why I love skiing. Gliding over a piste you spy some untouched powder and want to be the first to trace an s-like trail through it; never mind it comes out looking more like a mathematical equation – you floated! This, surely, is what I love the most. In the gondola, you strike up a conversation with the woman next to you, who has traveled from Hong Kong or Austria or New Zealand and is in love with your country, telling you how lucky you are to live here. Reminding me. This, too, I love. Sitting afterwards in a crowded bar as a local musician covers Free Falling drinking cold Kokanee Gold, in the company of friends who also have aching legs and some war stories from the day. The apres-ski tradition is surely the best part of skiing. Or is it? 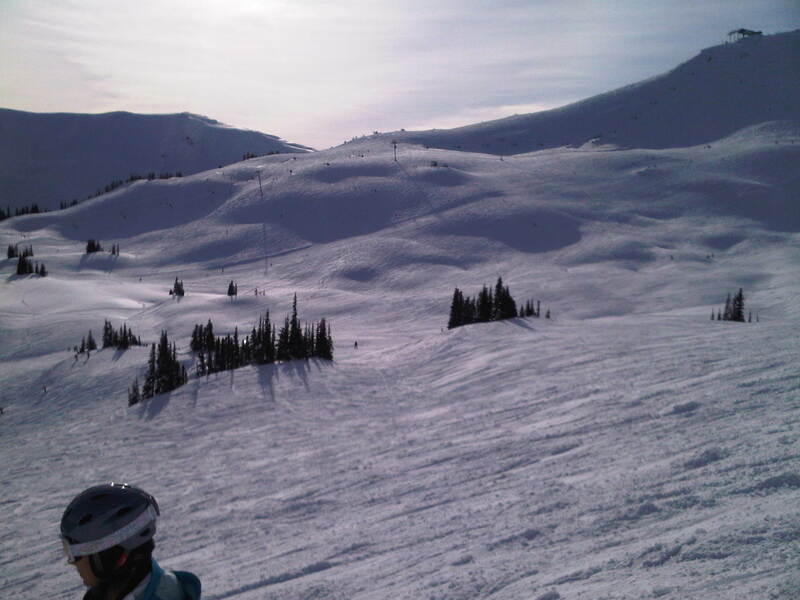 As each part of the ski day unfolds my loyalties shift, my favorite aspect changes like the snow conditions at Whistler; swiftly and without warning. My three children have each studied heroes in their kindergarten curriculum. I usually get about one sentence into the the characteristics of a hero before we talk about Terry Fox. He is the definition and embodiment of hero to Canadians, and it’s hard not to get emotional when we remember him. I am crying by the end of our hero discussion. Anyone dying before their time is sad. But picture a young man running across our large desolate country with one leg, long before a prosthesis actually geared for running was made, to raise money for the disease that made him an amputee. It wasn’t only courageous, it was super-human. Terry’s lasting legacy continues to raise money for cancer research. Although he wasn’t able to finish his Marathon of Hope when cancer spread to his lungs, he succeeded in so many ways. He brought Canada to its knees when he died nine months after halting his run across the country. The funds generated in his memory have been rolling in ever since, the current tally raised for cancer research under his name exceeds $500 million dollars. 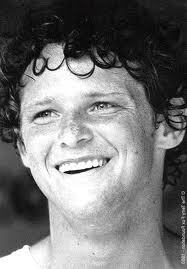 Terry Fox, up close and personal, and the reason we will one day find a cure for cancer. Since Terry grew up in Port Coquitlam, it’s right and proper that British Columbia should have an impressive memorial to this most famous of citizens. Yesterday they unveiled the plans for a new memorial in front of BC Place Stadium. Like I’d hoped, it is a stunning piece of art. It shows not one, but four bronze statues of Terry, each getting successively bigger, in various stages of his labored gait. Running is hard, running the distance Terry did seems almost impossible, running the way that Terry needed to run each step is, again, super-human. 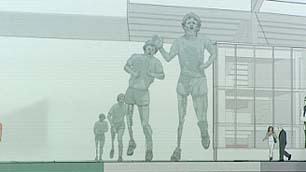 This rendering helps all of us to see the massive amount of effort that went into each step of his Marathon of Hope. This sculpture of our Canadian hero will be created by Douglas Coupland – very fittingly, since Coupland is also a shining star from British Columbia. 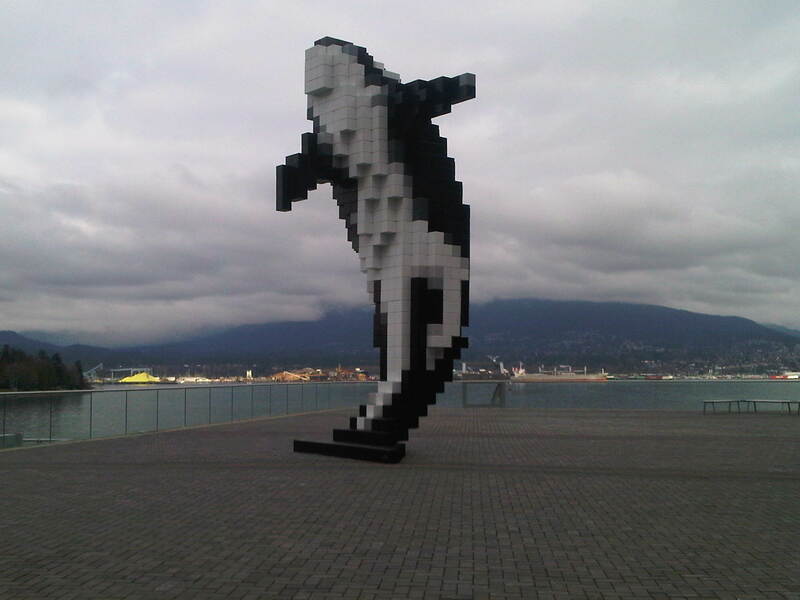 The artist that brought us the iconic book “Generation X” has also created the uber-cool statue Digital Orca at the new Vancouver Convention Center, proving he is a creative mind of many genres. Most interestingly, Coupland also wrote a biography of Fox, “Terry”, so has spent lots of time with the Fox family, a perfect choice to memorialize our Canadian icon. He reportedly worked with animators to recreate Fox’s running stride. When the original is unveiled this coming September with the opening of the refurbished stadium, it will inevitably bring tears to the eyes of anyone lucky enough to gaze upon it. As I write this, my brother is undergoing a surgery that will remove a cancerous growth on his knee; on Christmas Eve my sixteen year-old nephew finally left the hospital after two and a half months of intensive chemotherapy for lymphoma; my father died of cancer eighteen years ago. Heroes come in many forms, hopefully there will come a day when they don’t need to conquer cancer for that worthy status. Thanks to Terry Fox, that day will come sooner than later. Twitter confounds me. Although I’ve never been to a rodeo, I feel like it’s the feisty calf that my cowgirl self can’t lasso. I have had trouble wrapping my head around this site, and was immediately dismissive of its necessity. Who cares what Ashton Kutcher is saying about anything? And pith has never been my strong point, so that 140 character minimum equates to writer’s block for me. But it’s hung around, and in fact is growing in leaps and bounds, getting harder to ignore. I had coffee with a Vancouver marketing dynamo, Jennifer Maloney, of Sip Publicity, and she encouraged me to get on Twitter. Her explanation was that Twitter was like one big cocktail party, where you meander around catching snippets of conversation which will occasionally interest you, and some which will not. Facebook, on the other hand, is more like a barbecue, where you are in the company of those you know personally. Equating any site on the internet with a cocktail party is music to any SAHM’s ears. SIGN. ME. UP. I love the game of cocktail parties, a s everyone is ducking and jiving to have an interesting conversation with someone they barely know. I’ve used the old “I just need to refresh my drink” phrase in efforts to dodge conversations containing the words “projectile vomiting” on more than one occasion. Conversely I’ve lurked on the outskirts of tight circles discussing shoe sales or juicy tidbits of gossip, straining my ears so hard to hear that I practically fell on top of their cosmopolitans. Yet my social calendar is devoid of these swanky little numbers. Could Twitter really fill this crater? I took a deep breath and created a Twitter handle, although I still had no idea what I should be tweeting about. The next step was getting a list of followers, because what is the point of tweeting if no one is listening? I already talk to myself far too much. Jennifer had recommended looking at lists that interesting people are following. If you’re interested in yoga, you might follow people who are following Lululemon. I know, that’s a lot of following for one sentence, but welcome to the Twitter world of tweets. There are many different people on this social networking site for many different reasons. Like anything on the internet, watch out for spammers and anyone who tries to tell you how to make quick, easy money, and of course anyone who wants you to take your clothes off. In fact, it’s really no different from real life; spidey senses should prevail. As with any worthwhile achievement, the key to Twitter is patience and perseverance. You are not going gain followers overnight, something that bothered me for a couple of months. It’s a numbers game, where people generally follow people who have a large number of followers. These people are called influencers, and there is a certain amount of notoriety to be gained from hanging around them. Exactly in the same way as everyone wants to be associated with the popular kid in school. We grow, but we never really change. The Twitter world at first seemed like a strange universe, where people were speaking a language I had never learned, with weird symbols like @, #, RT and DM. But like skinny jeans, I’m slowly coming around to this fashion fad which seems to be here to stay. The days of drinking and driving are firmly gone, but drinking and tweeting is encouraged! Mix yourself a cosmo and join the party. Every dinner party I throw or gathering I host, my guests end up gathered around my computer, vying for elbow space as someone looks up a video on YouTube. This preponderance could be a result of my poor cooking skills or boring conversational tendencies, but I prefer to think of it as a trend that is happening across dining rooms in the world as social media furthers its impact on our lives. With politics being too polarizing, reality television getting old and the news being almost exclusively depressing, YouTube has established itself as the savior-topic for social gatherings in my household. Have no fear, YouTube is here! Last Saturday night, the featured videos showed delusional children and weird animal behaviors, both boasting huge hit numbers. Other evenings have showcased funny droid spoofs of husband and wife scenarios, hilarious sports bloopers, and occasionally we have sat through videos that their children have uploaded. According to their site, YouTube receives over 2 billion hits a day, and the average person spends fifteen minutes a day surfing their network – my dinner guests clearly among them. Since my fifteen minutes mostly occurs when friends are showing me things, that translates to a lot of people spending boatloads of time on this site. I’m told that besides its amusing and iconic videos, there is also a huge catalog of useful how-to videos on YouTube that teach people things from how to speak french to installing counter tops, so the popular site serves a useful purpose. My personal experience has not been particularly positive – I have searched the site very rarely, mostly before going to a concert when I want to watch the band’s videos. If it’s a popular song by a well-known artist it is usually the first thing that appears. If not, I may end up watching Betty Sue plucking out her acoustic version of the song, or a llama giving birth to a squirrel, you never know. To find an illustration for my point, I just searched for “Phoenix” on YouTube, and the first featured video was indeed Phoenix, the band, but the other featured videos on the sidebar were named “Tips and tricks on how to save money on printer ink” and “I PEED ON IT SO IT’S MINE!”. The search engine seems to spit out random videos that have nothing to do with my search criteria, and it annoys me. In fact, my experiences with YouTube are similar to my experiences channel surfing during daytime television: extremely rarely do I find something worth watching, and mostly it saddens me about the state of humankind. But for all of the misadventures and crap that is on YouTube, there are irrefutably diamonds in the rough; creative and brilliant missiles produced by amateurs on a budget of zilch, or hilarious moments of everyday life caught on video. This is the stuff good dinner parties are made of.